In Part One of our comparison, we tested micro screen gutter guards from LeafFilter, GutterGlove, Leaf Solution and DiamondBack. In the second half of our test, we’ll look at solid gutter covers from LeaFree, the Solid Gutter Cover that’s available at Home Depot, Lowe’s and hardware stores, and Elko’s GuttaPro. The products were selected because they represent three price points in the market. LeaFree is available from home improvement, roofing and gutter contractors, GuttaPro is also sold through a dealer channel, and the Solid Gutter Cover is a do-it-yourself gutter guard available at most home improvement retailers. Solid surface gutter guards work similarly to one another by using surface adhesion/tension as the basic principle of physics. The premise behind the design of these products is that water adheres to the solid surface of the gutter guard and flows around a nose into a slot that is near the front edge of the gutter. The products have many different designs that purport to one up the next, but they all work in a very similar fashion. The easiest way to describe this is that the guards work in the same way as putting a drinking glass under running water: the water adheres to the glass and follows the curves until the water drops into the sink. Now that you have a basic understanding of how solid surface gutter guards work, let’s jump into the reviews. LeaFree — The most industrial strength of the solid surface gutter guards tested, LeaFree is made of heavy gauge aluminum and is available in several colors. The guard installs under the first course of shingles and goes into place relatively easily. LeaFree is secured to the gutter lip with sheet metal screws. The LeaFree profile is considerably higher than the other guards and screens we tested. The gutter guard has a channel that runs horizontal with each section at the rear of the guard. The top surface of the guard sits surprising flat, and the nose curves around to a relatively wide opening into the gutter. 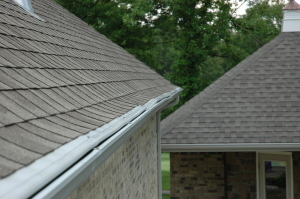 Prior to installing the guard, we thought the rear channel was the first point of contact with water that flows off the shingles; however, the channel actually sat under the shingles, and it appeared that this channel was in place more to stop the back-flow of water that occurs because the top of the guard was flat. If the top of the guard had a forward slope, then this addition channel would likely be unnecessary. LeaFree handled a decent amount of water, but as the flow increased under our downspout, approximately 20-30% of the water “missed” the nose and splashed over the edge of the gutter to the ground. By contrast, every micro-screen easily handled that amount of water and more without any spillage. Even though the top of the guard sits flat, shingle granules will wash off the guard without any problem. This issue is that shingle granules will easily enter into the gutter along with other debris. Elko GuttaPro — GuttaPro and its sibling, GuttaGard, are touted by Elko as being an inexpensive aluminum gutter guard, and that pretty much fits the bill. GuttaPro is installed by dealers and contractors whereas GuttaGard is available for the do-it-yourself market. GuttaPro is a low-profile aluminum guard that slides under the first course of shingles and secures to the front edge of the gutter with metal brackets. The concept is straight-forward and the guards are easy to install. The gutter guards are available in a handful of colors. The metal brackets slide under the curve of the guard, which means that the nose sits less than an inch above the gutter lip whereas the top of the nose on LeaFree is approximately two inches above the gutter edge. Because the nose sits so low, it can handle a large percentage of the water when it was placed below our downspout. The angle of the guard was more consistent with the slope of the roof shingles, so the combination of the low-profile and angle allowed shingle granules to roll off the top of the guard. The drawbacks with this system are that because the nose sits as low as it does and it uses a rudimentary bracket to hold the guards in place, the opening into the gutter can vary and is hard to keep consistent along a run. 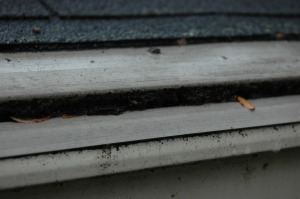 The inconsistency in the gap opening and the fact that the nose sits behind the gutter edge, shingle granules and small debris will more easily enter the gutter. Solid Gutter Cover (formerly known as Cinch) — Readily available at your local big box home improvement retailer, Solid Gutter Cover is made of PVC and is available in white and clay, two of the most popular gutter colors. It’s not available in brown because the dark color is difficult to manufacture and maintain due to the amount of heat is absorbs once installed. As I have stated in other posts, I used to distribute this product to the do-it-yourself market years ago prior to it being available in home improvement stores, so I have a lot of familiarity with it. The core design has remained the same although the manufacturer has modified the nose over the years. Solid Gutter Cover is easy to install. It slips under the first course of shingles and hooks onto the gutter edge. Sheet metal screws can be added on the drip lip to hold the guards in place. It maintains the same slope as the shingles and it sits lower than LeaFree and higher than Elko’s GuttaPro. The slots are consistently spaced across each section and were the smallest tested. The benefit is that it is more difficult for debris to enter the gutters, but it’s more likely that the slots will clog over time, especially in yards where the trees shed small leaves. Shingle granules will typically wash off the guards surface to the ground or into the gutter. While it was easy to tell which of the micro screen gutter guards shed the most shingle granules, it was more difficult to decipher which of the solid gutter guards performed the best due to the concentrated nature of our tests. Based on the products’ design characteristics, Solid Gutter Cover will shed the granules the best followed by LeaFree. Elko’s GuttaPro will likely have the most granules enter the gutters. If you are looking for a gutter protection system that will truly protect your gutters from debris while absorbing the most amount of water, micro screen gutter guards are the way to go. 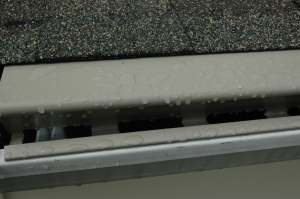 The micro screens handle considerably more water than the solid surface gutter guards; they have the lowest profile, and will NOT allow small debris such as shingle granules to enter your gutters. While some of the micro screens may hold some of the smaller debris on the screen surface — and may require an occasionally clearing off — water is still able to easily enter the gutters even during the heaviest downpours. It’s more likely that micro screen gutter guards will have to be installed by an authorized dealer, whereas two of the tested solid surface gutter guards can be purchased by do-it-yourselfers. The cost of best micro-screen gutter guards is comparable to the most popular solid surface gutter guards, while offering more comprehensive warranties and significantly enhanced performance. Next story What’s the Scoop on Shingle Sediment?